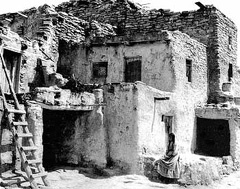 Home for Hopi people is rich in meaning and function within the Hopi annual cycle. Hopis are known for their ancestral multi-story plastered stone homes on mesa tops in northeastern Arizona. Today, with growing population and changing building styles, many Hopi families face overcrowding, have substandard housing, indoor air quality challenges with the coal heaters, inadequate plumbing, and much higher than average housing disrepair. by Joe Seidenberg, Program Development Director of Red Feather Development Group, and Susan Secakuku, Hopi tribal member and consultant. How to build homes relevant to Hopi family and ceremonial life was the focus of the presentation by Susan Secakuku in Sedona on Jan. 17. “Hopi has a strong heritage of home and community,” Susan began. She spoke of how traditional homes were made of sand, clay and stone with passive solar design and had patio areas for processing food. Hopis lived in villages on mesa tops next door to each other with a common wall between homes. Water was hauled from a spring below and was part of the women’s hard work. In the last 100 years, mnay Hopis have moved down below the mesa top villages. Each Hopi village has it own history and personality that defines where a home can be built. Homesites areas belong to the clan (which is a Hopi’s extended family). A Hopi has to be born into a clan that gives them access to Hopi resources, including the place to build your home. The home belongs to the clan of the mother. The woman owns the home which is usually passed on from her Mother. Historically, the man went to live with his wife. The extended family congregates at the family clan house during ceremonies and can feed 600 people over 2 days. Baby namings, engagements, weddings and death ceremonies are all centered in the home. Managing a Hopi home within the traditional cultural context is a commitment to a lifestyle. A Hopi woman’s home has to have an outdoor cooking area for simmering huge pots of lamb stew over a fire as well as a bread oven, piki house, and pikami pit. –How to build homes relevant to family and ceremony life? –Who will take on the obligations to inherit the family home? –Are you willing to commit to the Hopi traditional lifestyle? Susan Secakuku owns Secakuku Consulting, a firm that specializes in independent curatorial services for museums on Hopi content and collections, research and writing on Hopi content and developing cultural interpretative products for educational or cultural tourism needs. Susan mediates disputes over orchards and houses. She also offers cultural program development, grant writing, and facilitation services. Ms. Secakuku is a published author of “Meet Mindy: A Native Girl of the Southwest.” She is a Hopi tribal member from the village of Sipaulovi. She currently serves as trustee for the Museum of Northern Arizona and Vice-Chair of Red Feather Development Group’s Board of Directors. A big thank you to Susan for this candid, informative discussion and for taking time from her busy life to drive down 150 miles to Sedona. “Hand up, not hand out” is the approach Red Feather takes at Hopi. Joe said that sustainability–how to make a lasting difference–guides this work at Hopi. In the past 10 years at Hopi, Red Feather has built eight new green homes and does home and safety repairs and roof replacements. With a focus on education and self-empowerment for Hopi people, Red Feather promotes Hopi volunteerism and offers DIY workshops at Hopi such as weatherization, healthy home and green job training. Sustainable home goals Red Feather has are based on a model of meeting social and community needs to provide toxic-free, energy efficient homes. “These homes should be affordable and safe and Hopis should have the opportunity to learn skills to create their own know-how, ” Joe said. –insect and rodent infestations–under and unemployment up to 70% cause cyclical poverty and dependence on outside help to do repairs and home building. Weatherization training with hands-on experience and the Hopi participants take home a weatherization starter kit for them to install in their own home. Women’s Repair Class with hands-on experience and the ladies receive their own took kits to empower their own home repair initiative. He said the ladies really enjoyed this experience. Green Jobs Training in which Hopis get weatherization certification training, learn about lead removal, solar and wind installations, small business development and more. Youth Build Initiative for high school students and Healthy Home Camp for K-6. Health and Safety Assessments and Repairs. Strawbale Construction of new energy efficient homes. A big thank you to Joe for organizing this insightful program and taking time to come down from Hopi and Flagstaff where he works for Red Feather. We also appreciate his subsequent meeting with us to explore ways Crossing Worlds Hopi Projects could provide assistance with some Hopi home repair projects. Red Feather Development Group, a non-profit, welcomes you to join ($35 member fee). Volunteers are welcome to help with their Hopi home repair and building projects.